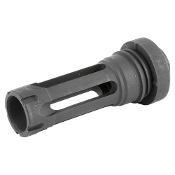 YHM - Phantom 7.62MM QD Flash Hider 5/8"-24 | DEZ Tactical Arms, Inc. This flash hider is used for our .30 Cal. Phantom Q.D. Sound Suppressors YHM-3300 and YHM-3300-Ti. It retains the excellent flash hiding capabilities of the original Phantom. Available in a wide array of thread sizes. FREE installation is available for all YHM products onto your rifle. Some restrictions apply, call for details. This flash hider WILL NOT accommodate our 5.56 sound suppressors or our .30 cal. Light Tactical (LT/A) sound suppressors.